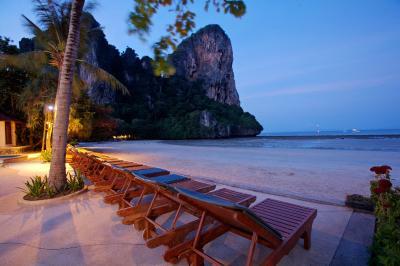 Lock in a great price for Railay Bay Resort & Spa - rated 8.2 by recent guests. The place is amazing for activities and romantic cruises and sunsets. The staff is amazingly nice too and is always willing to help. Perfect location right on the beach, good breakfast, clean and spacious rooms, beautiful pool with amazing views! Very well organised transfers. 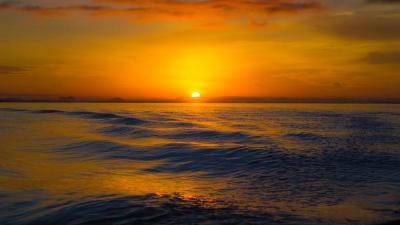 The resort is in a great location, beautiful beach and lots of shops and restaurants near by. The location is amazing! Staff wonderful, nothing too much trouble. Plenty to do with activities or just relaxing by the pool. Beach views are amazing, location on the beach front is great but many other hotels also occupying similar spots along the beach. Large variety of food at breakfast. Plenty of kayaks available to rent Second pool usually wasn't too busy so had plenty of room for sunbathing etc. The Hotel was lovely on the beach. Our room spacious and luxurious. Lots of lovely walks with spectacular views. Cheaper Eats available on other side of area. Comfy beds, spacious room. Deep bathtub and large shower. Bungalow was cute, we had a little private jacuzzi. Shower was lovely, room had all the necessary amenities. A-class service from start to finish. The transfer is a bit expensive, but we arrived late and the hotel staff managed to get us safe and dry in our room with our bags after 5 distinct vehicles (amazing logistic) - worth it! The room was very beautiful and big (the cheapest one), and it was about 500 mts from the lobby and the main beach, quick walk. The beach pool is amazing, in front of the hotspot of the beach and next to the bar and restaurant. 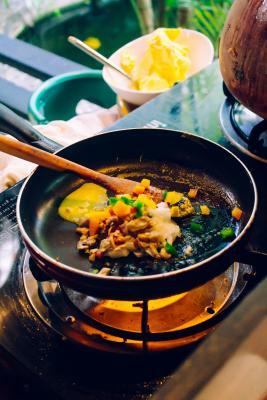 We also booked with the hotel the Hong Island tour with speed boat (which was about same price offered in the street and the experience was very good), and the cooking class (HIGHLY recommended). Stretching across the white sands of Railay Beach, Railay Resort & Spa offers spacious cottages set in tropical landscapes. 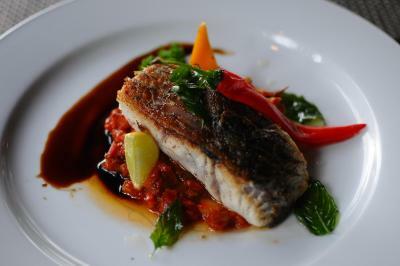 It features free WiFi throughout, a beachfront outdoor pool and a restaurant. Offering free parking on the mainland at Ao Nam Mao Pier, Railay Bay Resort & Spa is a 20-minute boat trip from Ao Nam Mao Pier or Ao Nang Beach to Railay Pier. Featuring private balconies, tropical-style cottages at Resort Railay feature casual cane and wood furnishings. In-room comforts include DVD player, a safe and a spacious bathroom with a bathtub. For leisure, guests can relax with soothing massage at Railay Spa or try activities like paddle canoeing and rock climbing. A tour desk offers help with trip planning. 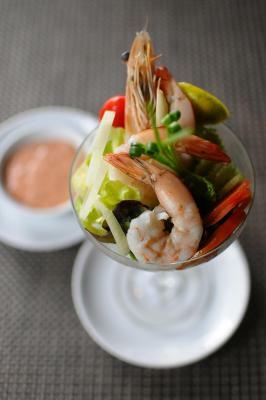 Cool sea breezes accompany seafood and pizza specialities at Railay’s restaurant. Room service is also available. 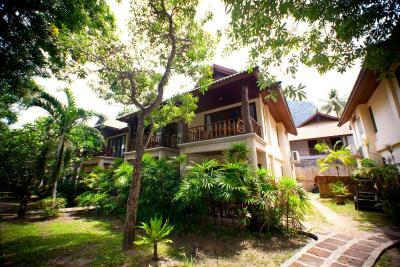 This property also has one of the best-rated locations in Railay Beach! Guests are happier about it compared to other properties in the area. 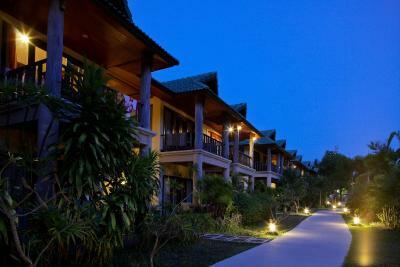 Railay Bay Resort & Spa has been welcoming Booking.com guests since 10 Jun 2010. When would you like to stay at Railay Bay Resort & Spa? Featuring an outdoor spa bath, this cosy cottage is fitted with a seating area, a safety deposit box and a minibar. Its en suite bathroom is supplied with a shower and free toiletries. Features a Spa bath, sofa bed and private garden view. Room with satellite TV, DVD player and private bathroom with bath and shower. This villa features air conditioning, private pool and minibar. Railay Bay is the large resort on west Railay beach with close to a short promenade (walking street) lined with restaurants and shops. Only 15 minutes to Ao Nang by long tail boat,15 minutes to Pra Nang cave and high limestone cliffs. House rules Railay Bay Resort & Spa takes special requests - add in the next step! Railay Bay Resort &amp; Spa accepts these cards and reserves the right to temporarily hold an amount prior to arrival. Railay Bay Resort & Spa accepts these cards and reserves the right to temporarily hold an amount prior to arrival. 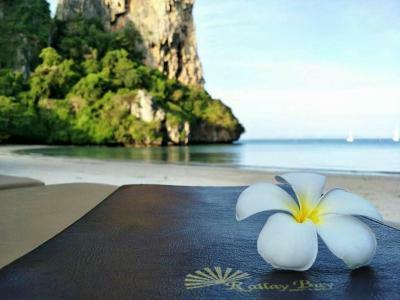 Railay Bay Resort & Spa offers a transfer service from Krabi International Airport at an additional charge. Guests are kindly requested to inform the property in advance if they wish to make use of this service. Contact details can be found on the booking confirmation. The resort can only be accessed by a long-tail boat. 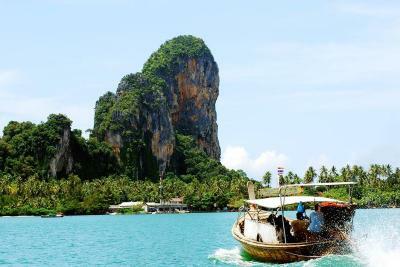 From Krabi Airport, guests will have to take a taxi to Ao Nam Mao Pier or Aonang Beach to catch a boat to Railay Beach. The resort is located next to the Railay Pier. Please note that the name of the guest on booking confirmation must be the same name as the credit card holder. Guest must present the same credit card used to guarantee the booking when checking in or making payment at the hotel. The hotel will collect a new payment if guests fail to present their credit card upon check-in. For bookings made from 5 March 2018 onwards, a compulsory Gala Dinner is included in the room rates of 24 December 2018 and 31 December 2018. The rates of the Gala Dinner are based on room type and occupancy (guests sleeping in extra beds will be charged separately). Please contact the property for more details. 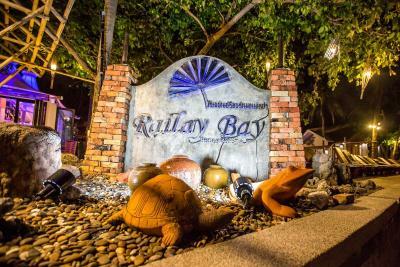 Please inform Railay Bay Resort & Spa in advance of your expected arrival time. You can use the Special Requests box when booking, or contact the property directly with the contact details provided in your confirmation. Old and outdated standard. Very bad and strong smell of curry in the bathroom. The cleaning personell were friendly and tried their best and cannot be judged for this. Open cracks by the door and bathroom, so warm air and insects and gekkos could enter freely. Smell of sewerage and garbage in the area, so seems like the infrastructure of Railay is at its breaking point. Small and crowded pool area by the beach. Really hard to find the hotel office at the pier. More sunbeds and shade umbrellas. I think one of the pools should be an adult only pool. First we got cottage, which was an absolute disaster. Extremely moldy rooms stained matrasses, garbage everywhere! My guess is that it was severely damaged by tsunami in 2006. Then after arguing with staff we got deluxe double room in 2nd floor. Which was tolerable. Railay beach overall is a messy tourist trap, better to stay out of main spots. Main pool area was not enjoyable, so we stayed at the other pool which was super basic and average, but at least clean. SUPER RUDE general manager, the rudest person we met in whole Thailand..arrogant and not oriented to client needs. Overcharged place!!!!!! Beware, avoid and run! Visit Railay beach by boat, no need to stay there more than half day. Btw you cannot reach lagoon if you are amazed by photos in Google, forget about it! All of peninsula is overpriced and overrated AF. Decent breakfast with a beach view. 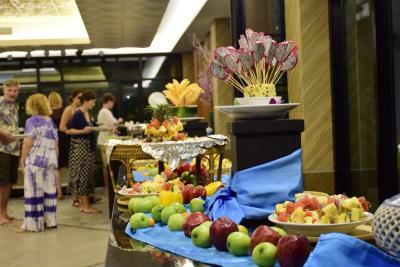 Breakfast was great - loads of choice. Two swimming pools - both beautiful. We were in a bungalow with a private Jacuzzi pool - it had its own garden and pond. It was so peaceful. Aircon great. Can't fault it. Prices on the high side for restaurant and bar. On the last day the air conditioning broke which was not fixed as promised. Customer service could be improved. Great location, views and pool. 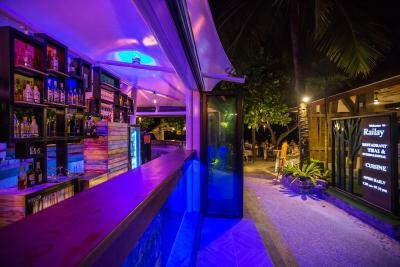 The poolside drinks and plates were cleaned only at the end of the day after sunset- waiting staff would literally walk past glasses,cans and plates all day long. The first room we were taken to, had mold over the wall and smelled of mold. One of the staff laughed at me when I demanded to change room- language barrier I assume, but still totally inappropriate. They also tried to charge me for a missing coffee cup at the end of the stay (bear in mind that stuff moves between the bar, restaurant, pools, and rooms all the time). The staff appeared uninterested in hospitality, and more concerned about getting their tasks done frequently. Although, it didn’t bother me, the wifi was terrible in the room and somewhat better at the restaurant and pool. Considering the premium cost of the experience ( we had two double rooms), I would not stay here again. Nice array of food at breakfast, and great views of the water over breakfast. Vegetarian partner had plenty of options. Loved the accomodations, loved the breakfast buffet, loved the pools!! Rooms are looking a bit tired in places, they would benefit from a facelift. After it rained we had a few cockroaches in our room, although harmless and probably the norm in this climate it meant we didn't really feel comfortable. Our air conditioning unit also leaked lots of water on our first night around 3am. Service in the restaurant was hit and miss, one day they were super slow and the next they were very attentive. Hotel drinks and Food very pricey. We walked to other side each day.